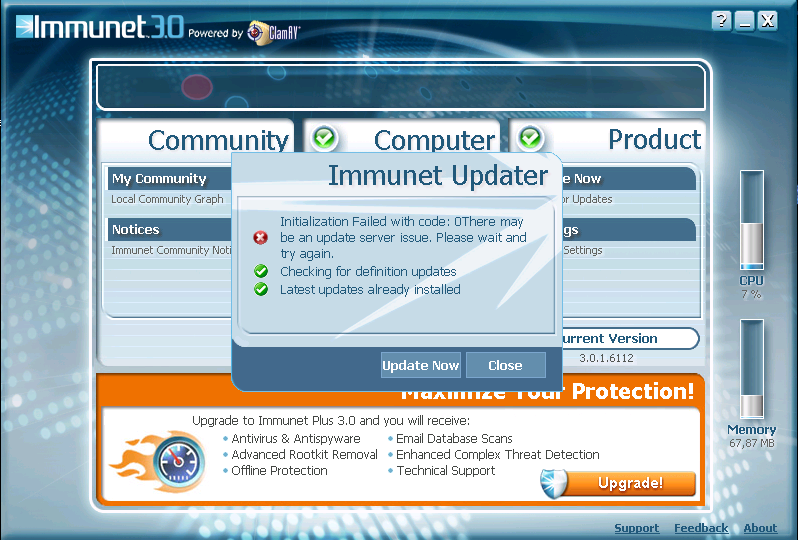 just installed Immunet 3.0 and added the proxy settings in "Signature configuration UI". "Run freshclam to test configuration" works perfectly and download the last update, but "Immunet Updater" always fails. Is there other place to configure the proxy settings for the updater? I too have not been able to identify where I can specify the http proxy, especially as the immunet site recommends a http proxy for LAN installs with a high number of client computers. There is a section in the freshclam.conf, which works for manually updating that, but has no effect on the rest of the immunet program (updates, community login, community notices). this must be a basic issue that many users have experienced, yet the forums / google searches a vague. To got my install to work with the proxy - I set my windows Inetinfo manually. (you may need to run the cmd as administrator), and there is a different procedure for XP. Once i set this and restarted the PC it was able to connect. Thak you David, I'll try that, but I think XP uses a different commands in netsh. its alot easier to use proxy sites in my opinion..